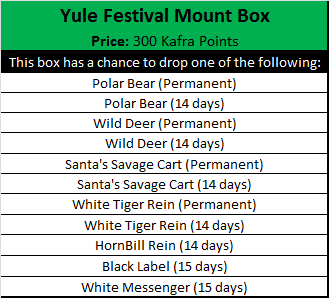 Let's celebrate the Yule Festival! This year we've thrown out all the stops. We have a big brilliant Christmas Tree sparkling in the middle of Prontera as well as a few familiar Festive Faces! 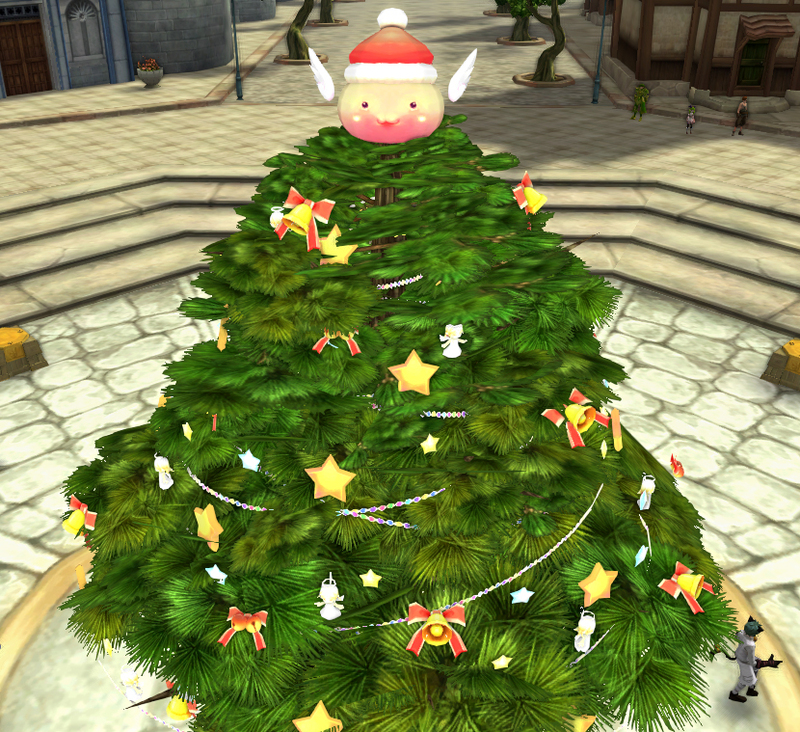 That's right, Santa Claus is back and so are the antics of the mischievous Porings Gang! They stole all his Wrapping Paper and Santa needs your help getting them back! Help him get back the wrapping paper and he might have a few presents of his own! How to find Santa Claus? 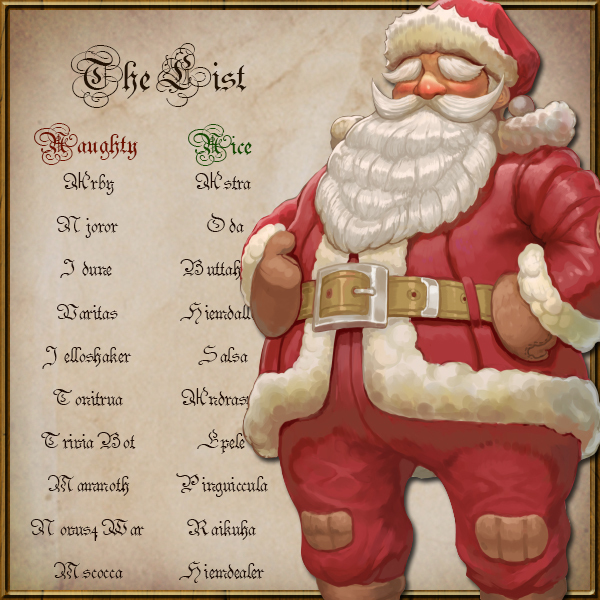 You will find Santa Claus checking his list in the middle of Prontera. Listen to his tale. 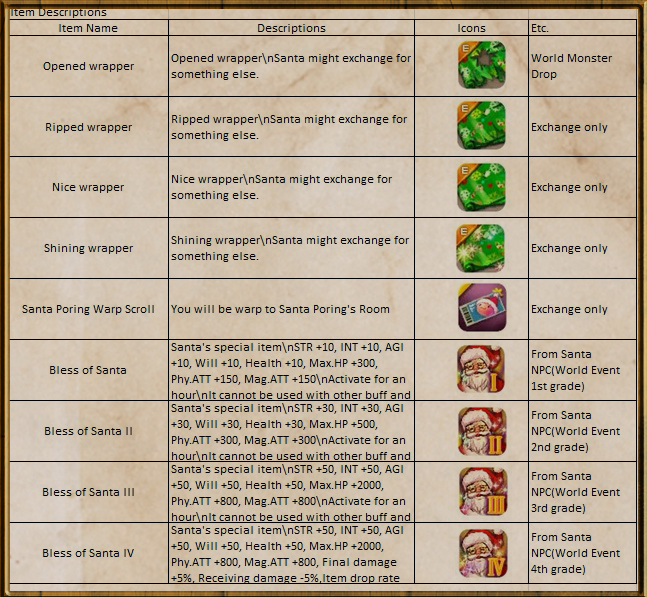 Collect wrapping papers for a chance to not only get cool buffs but also a chance to get to the Santa Poring's Room! You can collect these wrapping papers by killing world event monsters and turning them in for bigger and better prizes! 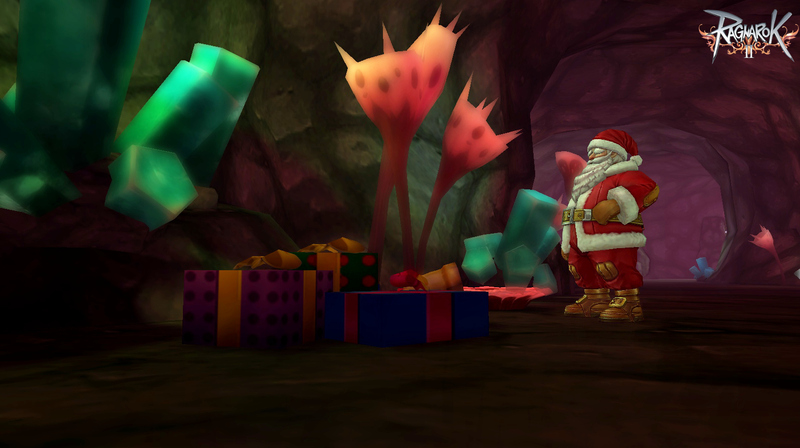 Once in the Santa Poring's Room, it is now time to collect the stolen wrapping papers. 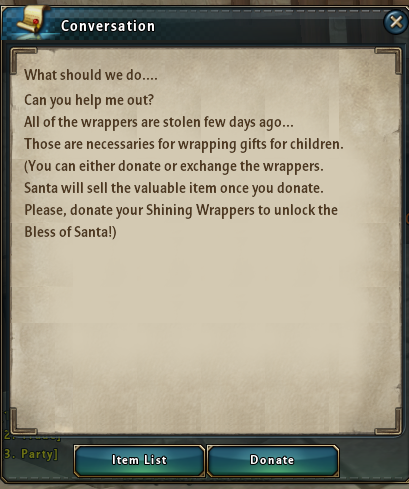 After you've taught all the bad santa porings a lesson, you may turn in the colorful wrapping papers for some useful buffs. You might also find a few familiar faces hanging around Prontera! 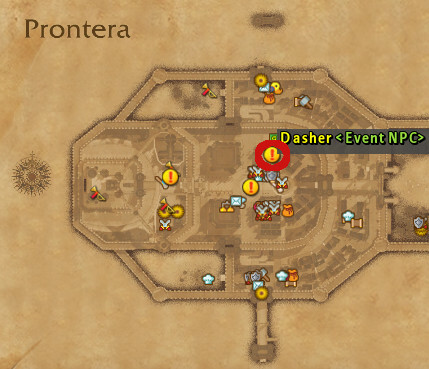 Snowflake collecting is back on the menu, but keep in mind you will need to be level 15 before you can start the quests. 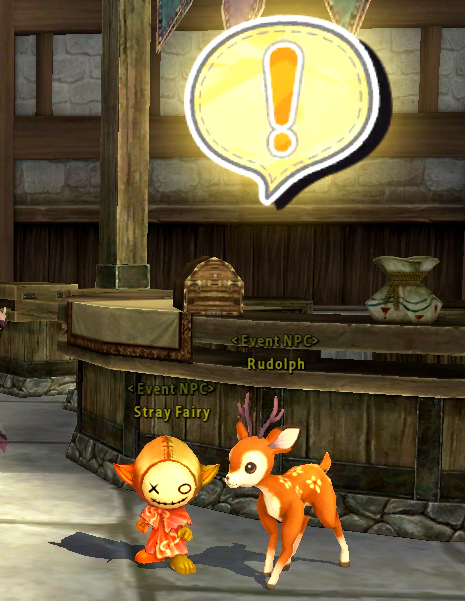 Exchange the Lutie Snowflakes at the Stray Fairy for holiday themed costumes and consumables! 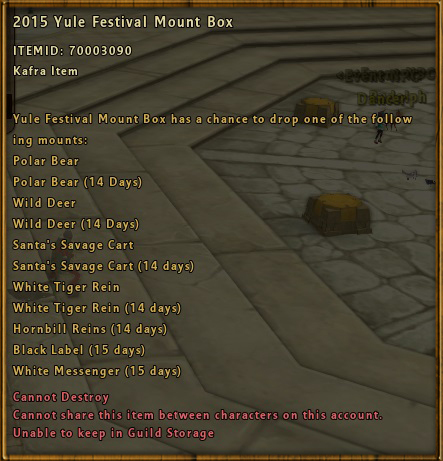 Additionally, if you are level 50, there are two new Yule Festival dailies that can be completed. 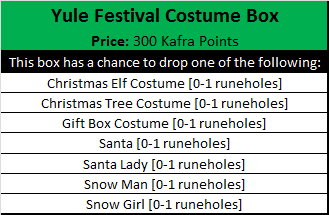 Finish the quests from Rudolf (in Prontera) and Santa Claus (in a cave behind Donner and Blitzen), and automatically receive a brand new holiday themed Khara Title with the following stat increases. 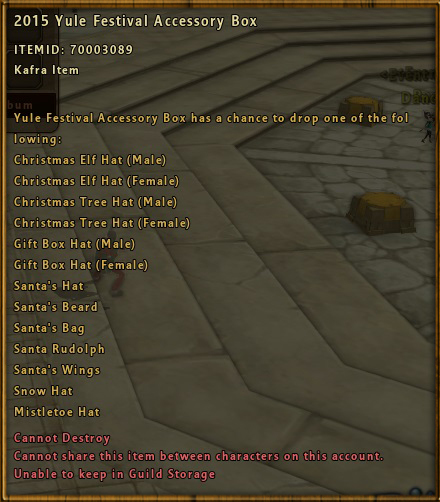 Complete the quest God Bless Christmas and you may earn the Christmas Wreath Title! 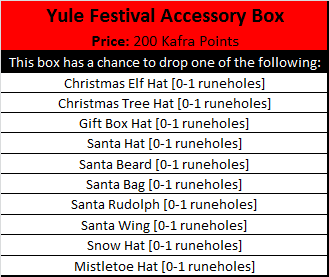 You can do this by collecting these items to eventually earn the Lutie Santa Piece! 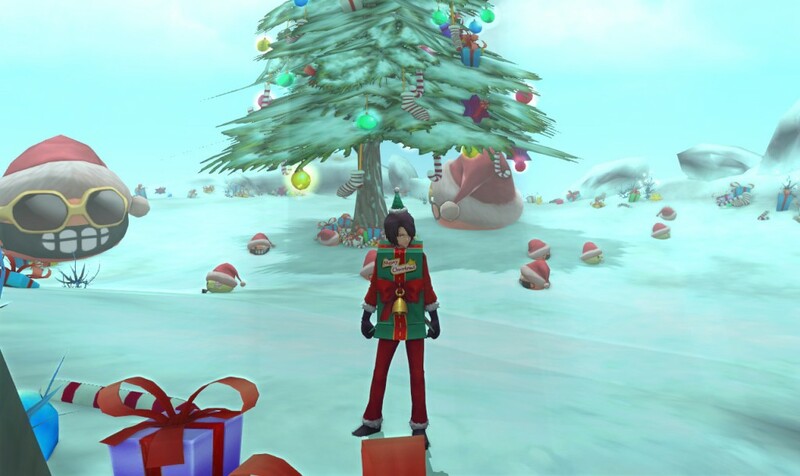 Complete the quest Red-Nosed and you can earn the Christmas Rudolph Title. 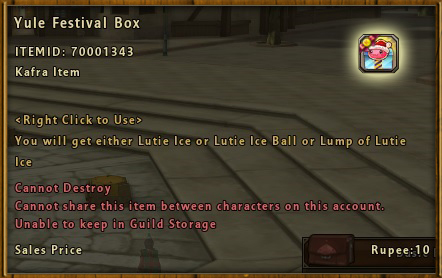 You can do this by collecting snowflakes and ice to eventually earn the Rudolph Glow Ice! 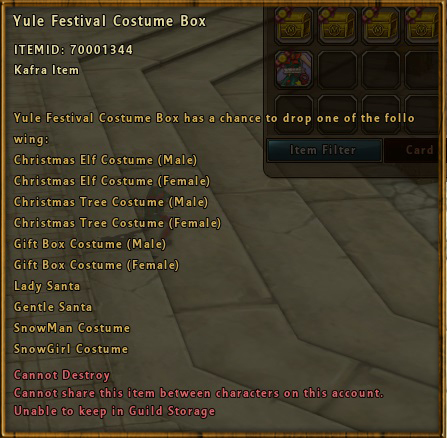 If you are looking for some stocking stuffers don't forget we have the Yule Festival themed items for sale! A great gift to supplement items for titles! If that's not enough we have more goodies showing up in the kafrashop! Get ready for some wintery fun and remember to be good, because Santa's checking his list and he's checking it twice!